The collection consists of more than 3000 posters acquisited through purchase, donation and other exchange of printed materials. 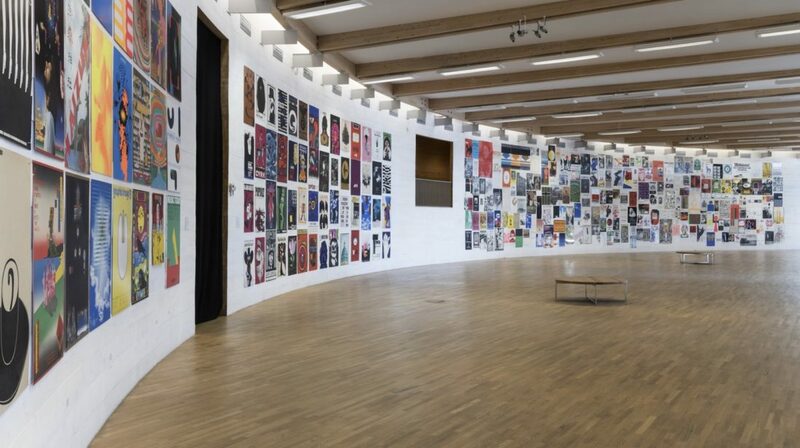 In addition, Henie Onstad arranged eight surveys of poster art within the first decade, and much of what was displayed was purchased and collected. Acquisition ceased in the early 1980s, and for almost forty years the posters remained untouched in Henie Onstad’s archives. The exhibition includes a selection of posters and catalogues from institutions such as Stedelijk Museum, Moderna Museet in Stockholm and Louisiana, the design of the first identity for Henie Onstad made by Sigfried Odermatt, original design proposals made for the institurions first poster in 1968, a room dedicated to the posters of the Swiss Norwegian graphic designer and artist Paul Brand, as well as a selection of Japanese and Polish posters from the collection. The exhibition includes work from from a wide range of internationally renowned artists and graphic designers such as Willem Sandberg, Wim Crouwel, Andy Warhol, Max Bill, David Hockney, Jean Tinguely, Jan van Toorn, Armin Hofmann, Richard Hollis, Pentagram, M&Ö, Shigeo Fukuda, Tadanori Yokoo, Jan Lenica, Dieter Roth, Buckminster Fuller and Sture Johannesson, as well as various Norwegian artists and designers. The exhibition is curated by Lars Finnborud and Aslak Gurholt.